We’ll start by covering some aspects of Google Chrome architecture and then describe some of the main tools it offers for analyzing and debugging memory. For the experiments, we used Chrome Canary, version 45.0 in a Mac. We define shallow size as the amount of memory used by the object itself (not counting the size of references). The retaining path of a node is a directed path from the root to that node. This is used to determine whether a node is still being used, because otherwise it can be garbage collected. The retained size of a node is the amount of memory that would be freed if it was removed (includes the memory from nodes that would be deleted with this node). A node u is a dominator of a node v, is it belongs to every single path from the root to v.
– Numbers: can be represented as Small Integers (SMIs) if they represent integers, using 32 bits. If the number is used as a double type or needs to be boxed (for example, use properties like toString()), they are stored as heap objects. – Strings can be stored in the VM heap or externally, in the renderer’s memory, and a wrapper object is created. This is useful for representing script sources and other content that is received from the Web. – Objects are key-value data structures, where the keys are strings. In practice they can be represented as hash tables (dictionary mode) or more efficient structures when objects share properties with other objects or when they are used as arrays. A more in depth study of these representations can be seen in . – DOM elements and images are not a basic type of V8. 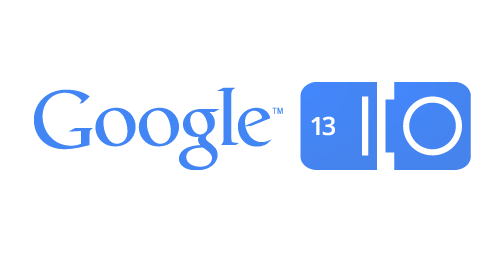 They are an abstraction provided by Google Chrome and external to V8. Objects get allocated in the memory pool until it gets full. At this point, the garbage collector is triggered. It’s a blocking process, so this process is also called the GC pause, which can last for a few milliseconds. Any object that is not reached from the root can be garbage collected. V8 classify the objects in two categories in regards of garbage collection: young and old generations. All allocated objects start as young generation. As garbage collections occur, objects that were not removed are moved to the old generation. Young generation objects are garbage collected much more often than old objects. It’s an optimization that makes sense. Statistically, if an object “survived” to many garbage collections, they are less likely to be collected, so we can make these checks less often. Now that we have a basic understanding of how Chrome deals with memory, we can learn about some of the UI tools it has for dealing with memory. 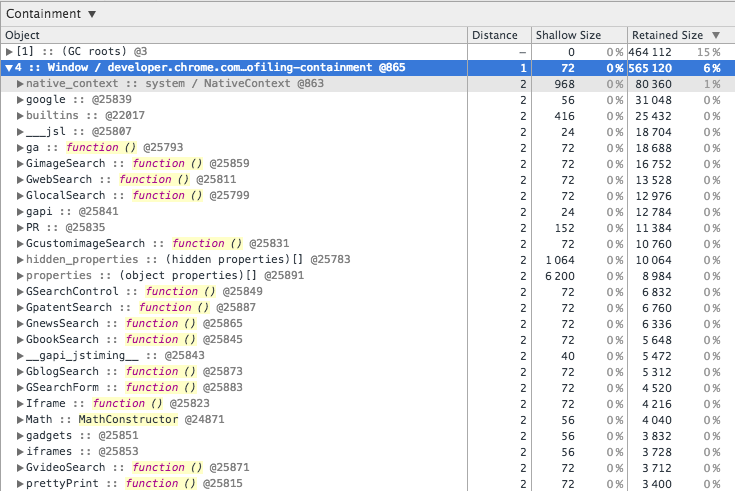 The heap snapshot dumps the current memory into the dev tools for analysis. It offers different views: Summary, Comparison, Containment and Statistics. The statistics is just a pie chart showing a break down of objects by their types. Not much to see here. Let’s focus on the other three. This is the default view. It’s a table representing a tree structure, like the one below. * Constructor – the name of the function used to instantiate an object. * Distance – represents the distance of the corresponding nodes to the root (try sorting by distance. You’ll see the Window objects with distance 1). And take a snapshot, we can locate the Item constructor. We see ~20k objects created and their shallow size (each has 32 bytes). Detached nodes. Nodes that are not part of the main DOM tree (rooted in the <html /> element) are considered detached. In the example below, we could have a DOM element with ID ‘someID’ and remove it from the main DOM tree. At this point it’s considered detached, but it can’t be garbage collected because the variable refA still refers to it (and could potentially reinsert the node back later). If we set refA to null and no other variable refers to it, it can be garbage collected. 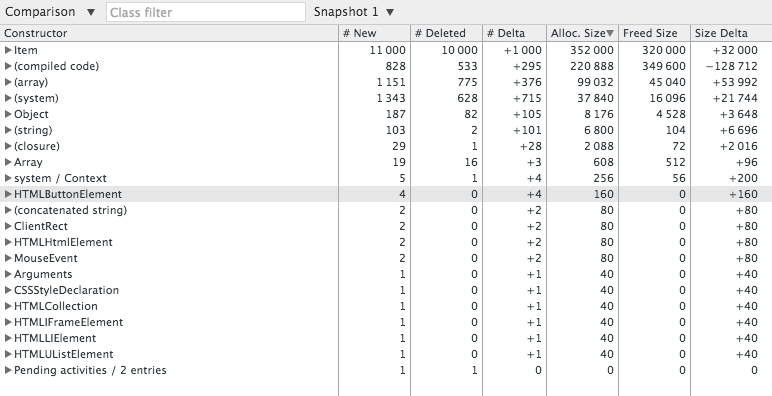 We can see the Delta column, showing the difference in number of objects compared to the previous snapshot, which could help with a memory leak investigation. We also have the amount of memory added (Alloc. Size), freed (Freed Size) and the net difference (Size Delta). The heap allocation tool (also referred as Object Allocation Tracker in the docs) takes snapshots at regular intervals until we stop recording. It plots a timeline of bars corresponding to memory allocated during that snapshot. The blue portion displays the amount of memory created during that snapshot that is still alive. The gray portion depicts the memory that has been released since then. We can do a simple experiment to see this behavior in practice. We create two buttons: one that allocates some memory and append to a given DOM node and another that removes one child of the node. The code for this setup can be found on github/kunigami. If we keep playing with the buttons while recording, we can see blue bars being created when we click “Append” and graying out when we click “Remove”. Google Chrome offers many tools for memory diagnosing and it can be overwhelming to decide which one to use. 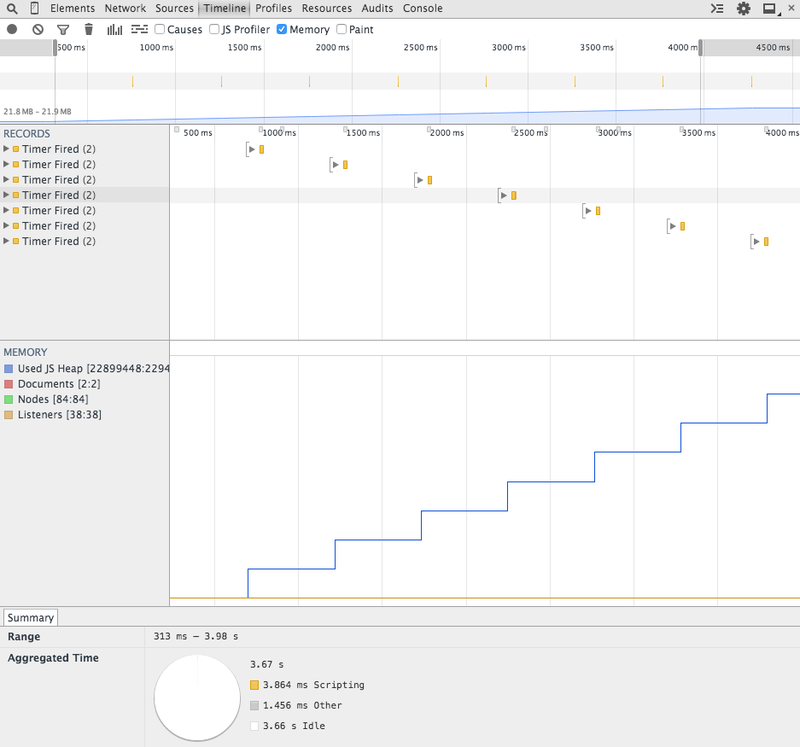 The timeline view is a good high-level tool to detect memory patterns (especially memory leaks). After that is spotted, the profiling tools can give more details on what is being allocated. This tool displays a lot of information, which can also be hard to read. The comparison view is useful in these cases because it only show differences. The documentation is a bit sparse, but contains good examples to try out the tools. These examples have some instructions on how to use the tools, but usually lack screenshots of the results.